So you’ve seen what The National and the Royal Court has to offer, and you reckon you can give it a good go. And why not? But before you tread the boards of the Olivier, you’re going to need to start somewhere a bit smaller. And that’s where fringe theatre comes in. The fringe theatre scene in London has had a renaissance of late, with rooms above pubs packed every night of the week with budding young theatre makers, trying out new and experimental things, but also making some of the most interesting theatre happening in the city at the moment. If you’ve got an idea for a play bubbling away at the back of your head, then let it bubble over and become reality through a course. There are prestigious playwriting courses at Soho Theatre and the Royal Court, as well as devising workshops on offer from practitioners like Bryony Kimmings and Complicite. 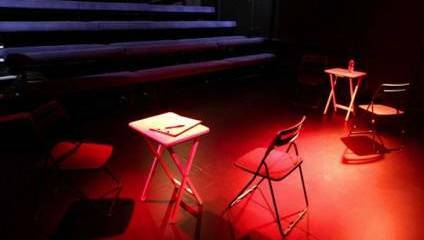 These can be a bit pricey however, and whilst they offer good practical advice and supply you with contacts, one of the best ways to learn about making theatre is just to get up and do it. To do this, you’re going to need somewhere to rehearse. Your living room might seem like an okay solution to this, but to get those proper rehearsal room juices flowing we recommend looking at places like Theatre Deli and the Exchange Theatre for affordable empty spaces dotted around London that all your actors will be able to get to. You could also talk to your local pub with an event space if they wouldn’t mind you commandeering it for an afternoon, in return for you propping up the bar for an evening, or see what offers bigger theatres have on – the Roundhouse frequently offers cheap space. Once you’ve started your rehearsals, you’re going to need to think about actually putting the thing on, and to do that, you’re going to need to get yourself a producer and a stage manager if you haven’t already, as well as entertain the possibility of set, lighting, and sound designers. This is where social media comes in mighty handy. There are plenty of Facebook groups and twitter threads dedicated entirely to helping these people find work, and for you to find them and give them some work. Our top tip is to talk to a couple of candidates before you make any decisions so you can work out who you get on with, because you’re going to have to spend a lot of time with them! You’ve got your play and it’s ready to go on, but where? Well to work that out your best bet is to check out fringe theatres in London and the work that they already have on. The Old Red Lion Theatre Pub in Angel has a long history and if you look at the back of the cyclorama in the wings you can see notes written on the wall from those who treaded the boards before you, from Trainspotting to the guys behind The Play That Went Wrong – we’ve all got to start somewhere, and this is a nice option. Alternatively, The King’s Head Theatre, The Hen and Chickens, The White Bear Theatre or the London Theatre are all black box studios just waiting for you to debut your play there. Once all your pals have come and seen your marvellous work here, you’re going to want to keep spreading it. A perfect way to do this is to get involved in one of the countries many fringe theatre festivals and get your work on in as many venues as possible. Camden Fringe is the perfect place to start, especially if you’re already London based because you won’t have to pay for accommodation! There are loads of theatres around Camden and Islington to choose from and you can get involved in all the London fringe theatre hype that takes place every summer. Similarly good for London folk is VAULT festival, which has been growing astronomically in recent years, and is now the go to for many hit plays returning from Edinburgh as well as first timers making their way in the theatre world. The guys at VAULT have a great system too – you pay nothing up front for venue hire, and they simply take it out of your ticket sales, meaning you don’t have to have loads of dosh to start with. - Make sure your press release is really good and gently nudge reviewers with reminders so that they know about it in plenty of time. Good reviews = bums on seats! - The fewer props, the easier your get in, get out, and general life. - Make sure all your friends and everyone you have ever met come to watch at least once, that is their duty as your friend/mum/bloke you met in a pub once, and don’t let them forget it. - Budget! It can still be quite expensive making fringe theatre so be sure to spend money in the right places and work out where you can cut corners. - A good poster goes a hell of a long way.